The US thirst for gasoline and fears of a hurricane have pushed the oil market further into uncharted territory, with prices breaking the $67 mark on Friday. US light crude closed $1 up at $66.80 a barrel, after hitting $67.10 earlier, while in London Brent crude closed $1.12 higher at $66.50. 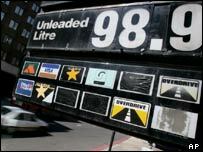 Worldwide petrol and gasoline prices are at unprecedented levels. US refinery stoppages have come just as car sales and demand hit highs, and amid persistant security fears. The latest surge has been partly triggered by more than a dozen breakdowns at US installations, the latest of which hit a ConocoPhillips refinery in Illinois. And fearsTropical Storm Irene, which could intensify to hurricane strength, is heading for the US East Coast have added to worries about supply interruptions. Earlier this week, US government figures showed a 2.1 million barrel decline in US stockpiles during the first week of August. With US economic growth strong and the latest data showing car sales at their highest level since the consumer slump following 11 September 2001, the stage is set for further upward pressure on oil, analysts said. "The petrol and gasoline situation in the US is probably the most worrying factor at the moment," said Simon Wardell, at Global Insight. "It looks like it could be an ongoing problem, because a shortage of refining capacity is not something that can be resolved quickly." Thursday brought a report from a Paris think tank, the International Energy Agency, which warned that producers outside the 11-member oil cartel Opec were likely to reduce output. And the ever-present security jitters are focused on Saudi Arabia, after a string of alerts from Western countries warning of imminent attacks, and Iran, where the new government is preparing to break seals on uranium reprocessing equipment. The two states are Opec's biggest producers. In real terms, stripping out inflation, oil is well below the $80 a barrel on average for the year after the 1979 oil crisis. But the average price this year more than $53 per barrel is higher in real terms than the level during the l973-4 first oil crisis.